Above: A collage of cover images from the recently donated Marshall - Morrow Collection. We recently received a generous and most important donation of sheet music from the Marshall and Morrow famiies of Alexandria, Virginia. This unique donation included sheet music from the period 1839 to 1870 and includes some of the most incredible lithograph covers we've seen from that period. Over the next few issues we will be featuring music from the various decades and showcasing the music so generously donated to us by the Marshalls and Morrows. This donation has significantly expanded our collection into a period where we had few examples. In addition, much of the music is from important American composers whose works have rarely seen the light of day for over a century and a half. The condition of the music is unbelievably good. Printed on heavy weight high rag content paper, many of the song sheets are undamaged and aside from some very little foxing with age, most are in near perfect condition. Several of the covers in the collection are full color lithographs of beautiful quality. Even those covers with "plain" titling are done in an ornate and beautiful manner so we think you are in for a special treat visually as well as musically. Many of these songs are unavailable in other collections and many are very rare so we are absolutely delighted and excited to present these important historical documents to you and are honored to have the privilege of preserving them for our collective future. Because the covers are so important, we also are adding the original cover art to our Scorch presentations so you can enjoy them in more detail than our thumbnail images allow. As a result, the Scorch files are much larger than usual so expect some delay in downloading. In some cases, the download file size exceeds 2mb so some will take quite some time depending on your type connection. The wait will be worth it! "Shirley Morrow Marshall, a young 88, received a collection of her grandmother’s music books many years ago. These bound volumes were referred to as the “German Music Books” because of the many German tunes and airs in them. But closer examination revealed a much richer collection of music pieces that had belonged to both grandmother Elmira Wood [Morrow] and to Elmira’s mother as well. Some pieces date to the early 1840’s. (actually late 1830's, ed.) Much later, probably in the 1870’s, Elmira had all her music collected together into six volumes and her name printed on the leather-bound covers. Elmira Wood was part of a wealthy industrial-arts family in New York City. Her father and then her five brothers – she was the only girl – owned a silversmith company. Wood and Hughes was known for exquisite pieces of fancy silver, including serving spoons, small dishes and tableware. The more elaborate items had small birds or busts of women attached. The music books were bound before Elmira was married and are indicative of the upper-middle class world in which she lived. Music was an important part of her home and social life, with fine instruments and music tutors for the dedicated. Elmira married John Morrow, owner of a successful roofing and sheet metal business in New York City. His company roofed the well-known Flat Iron building, among others, and created fanciful metal snow guards in the shapes of animals. They even made a viking head! In those days, the Wood and Morrow families summered at the beach in New Jersey and enjoyed riding in Central Park in the winter. Unfortunately, this life-style largely ended with financial losses in the 1920’s and ‘30’s. The family was left with some lovely silver pieces and great stories. After Elmira passed away, her books went to her daughter-in-law [a wonderful piano player] and then to her granddaughter. But few of her descendants play the piano and still fewer are interested in these “old fashioned” pieces. 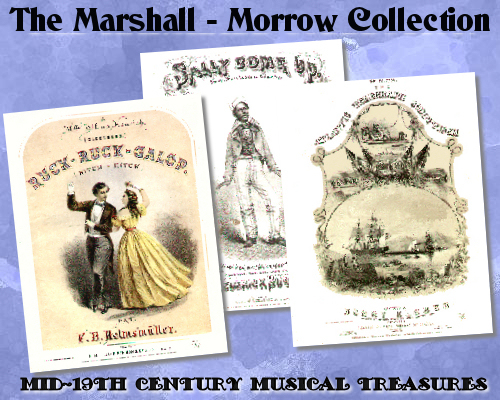 Now, the Marshall and Morrow families have decided to donate five of the these books of 19th Century song sheets, so that people outside the family can find enjoyment in the musical history captured in their pages." To preserve these pieces, Parlor Songs has laboriously and very carefully removed the individual sheets from the bindings, cataloged them and placed them in plastic sleeves in a temperature and humidity controlled environment. The books contained a total of 175 titles most of which we hope to eventually make available for viewing and listening on our site. It is our hope that these sheets will stand preserved for yet another century or more for the enjoyment of future generations. We are extremely honored to have been entrusted with this collection. This feature will introduce the breadth of the collection to you (in October we published an article about music from the American Civil War featuring examples from this collection) by providing examples that span the years represented in the collection. Following this article, we plan on articles featuring songs from the decades of the 1840's, 50's and 60's. Richard A. Reublin, December, 2008. This article published December, 2008 and is Copyright © 2008 by Richard A. Reublin and The Parlor Songs Association, Inc. Text, images or music may not be reproduced in part or in total without express written permission of the author or a company officer. Words by: Geo. P. Morris, Esq. Cover art: Litho. by Crow, Thomas & Co. In the 1830's, much of America's music was still grounded in the European tradition and a national identity for our music was yet to come. It would take the stimulus of composers such as Stephen Foster to begin creating our unique style of popular song. The year 1839 was one that was notable for the Amistad incident, where a group of slaves took over the ship transporting them. Charles Goodyear perfected the process of vulcanizing rubber making it a viable product and the first woman horse thief in America published her memoirs and on March 3 The New York Mirror printed some dinner conversation advice for gentlemen: "When you are seated next to a lady, you should be only polite during the 1st course; you may be gallant in the 2nd; but you must not be tender till the dessert." The lithography for the cover is un-attributed and represents the typical ornate titling that was depicted on sheet music during the 19th century. The expense of lithography art work was often reserved for the most popular songs or those that a given publisher felt compelled to illustrate. The majority of music during this period was the fancy titled lithography as depicted on this sheet. It should be noted that the cover states "Sung with distinguished applause by Mrs. C. E. Horn" who is presumed to be the wife of the composer, Charles E. Horn. The music is a simple and tender ballad, through composed with but one verse and no discernable chorus as would later emerge as standard construction for popular songs. The melody is simple with a very pleasant minimal accompaniment. The one feature worth separate mention is the use of sung triplets or ornaments at the end of each phrase. This song was in fact written by an English composer (Horn) who wrote a number of individual works for his wife as well as at least one Oratorio, Daniel's Prediction (1847) that included her as a member of the cast. Horn and his wife appeared at the New National Opera House in New York in 1840 staging a production of his romantic opera, Ahmal al Kamel, the Pilgrim of Love. Mr. Horn was billed as the musical director and a critic who attended stated that the opera was "tedious beyond endurance and sent away all who waited till its conclusion weary and exhausted." That is hardly a critique that would draw in an audience for the next performance! HORN, Charles Edward, born in London, England, in 1776; died in Boston, Massachusetts, 10 June, 1848. He was educated by his father, a well known German musician, and in 1809 made his debut as a vocalist at the English opera house in London. He studied under several noted instructors, and emerged in 1814 in London as an opera singer. He appeared in most of the large play houses and music halls of Great Britain and Ireland, both as a vocalist, conductor of music, and composer and during that time wrote many songs, some of which became widely popular. Among them are The Deep, Deep Sea, Even as the Sun, Cherry Ripe, and I've been Roaming. He first came to America in 1827 and sang in a number of major operas in New York then traveled around the country performing. He returned to London in 1832 where he opened a music store as his voice had failed him by then. Sometime before his death, he and his wife returned to America where she performed many of his compositions and he closed his career in Boston as a teacher of music and conductor of the Handel and Haydn society. 1843 was a year that saw the American West become a promised land for many people. In May the first major wagon train headed for the American Northwest set out with one thousand pioneers from Elm Grove, Missouri on the Oregon Trail. This year also saw the birth of the Minstrel show when the Virginia Minstrels performed the first minstrel show at the Bowery Amphitheater, New York City. Ulysses S. Grant graduated from the U. S. Military Academy and the first commercial Christmas cards were published (in London.). America in general had become a haven for many emigrants and among them and perhaps the most prevalent being the Irish. Between 1815 and 1845, nearly a million Irish, including a large number of unemployed Catholics, came to the United States. The men went to work providing the backbreaking labor needed to build canals, roads and railways in the rapidly expanding country. Irish pick-and-shovel workers proved to be very hard-working and were in great demand. American contractors often placed advertisements in newspapers in Dublin, Cork and Belfast before beginning big construction projects. The massive Erie Canal project, for example, was built by scores of Irishmen working from dawn till dusk for a dollar-a-day, hand-digging their way westward through the rugged wilderness of upstate New York. In 1845 the Irish potato famine forced millions more to leave their native land just to survive. In general, as was the case with most emigrants, the Irish were not looked on favorably and resented by many Americans (even though most of them at this time were no doubt emigrants as well!) and the most menial jobs were reserved for them. It is somewhat surprising to find this piece of music so favorable towards the Irish at that time. It is a grand and long piece that goes on for nine pages and tells the tale of the personal tragedy of one such emigrant who leaves his wife and child behind in Ireland in a church cemetery plot. The narrative on the title page explains the song as: "Portraying the feelings of an Irish peasant previous to his leaving home, calling up the scenes of his youth under the painful reflection of having buried his wife and child, and what his feelings will be in America." Given the subject, for the most part the music is bright and somewhat joyous as he reflects on his country and boyhood. The melody sounds a bit o' the Irish to my ear and may have been based on an Irish melody. The section during which he reflects on the loss of his wife and child is slower and more somber but then we return to the brighter side till a final thought of "Mary." The song includes eight verses, to see them all either view the music with the Scorch plug-in or click on the lyrics link below. If one were to sing all eight verses, I think it would become quite tedious. The poetry, or lyrics for this song were written by an accomplished poet and writer. Helen Selina Sheridan, (Mrs. Blackwood) (1807–1867), was a British song-writer, composer, poet, and author. As well as being admired for her wit and literary talents, she was a fashionable beauty and a well-known figure in London society of the mid-19th century.At seventeen, Helen was engaged to Commander Price Blackwood, the future Lord Dufferin, although his parents wanted him to marry more advantageously. After their London wedding in 1825 they went to live in Florence, but returned two years later with their baby son Frederick. From childhood Helen had written poems, songs and prologues for private theatrical productions. After she and Caroline jointly brought out a Set of ten Songs and two Duets, she started to publish her verse, sometimes set to her own music. Her name was not usually printed at first, but she did not stay entirely anonymous. Her most famous song is the The Irish Emigrant however she wrote many more including; They bid me forget thee and Miss Myrtle, the Charming Woman. William Richardson Dempster (1809-1871) I've not found so much information about Dempster. He was a very popular performer cited as a "popular singer of Scottish ballads" who did live in Scotland on at least two occasions. Despite the lack of biographical information, he composed quite a few songs including; The Blind Boy (1842), I'm Alone, All Alone, The May Queen, Let Us Love One Another and of course, the Irish Emigrant. One of his works, Cheer Boys, Cheer! was recorded by the American Brass Quintet in 2005. Music by: Unknown, "From a Popular Air"
Words by: Jesse Hutchinson, Jr. The Hutchinson family was one of the first major family ensembles in America. Described by many as the first singers of "protest" songs, they were well known for their songs that encouraged social change. A book published in 1874, A Brief Narrative of the Hutchinson Family describes the "progenitors" of the family, Jesse and Mary Hutchinson as "Farmers by profession, musicians by 'incident,' the father possessing a rare baritone, the mother a sweet and mellow contralto voice. The father with a strong physical constitution, the mother with a decisive nervous organization. Inured to the active duties of farm life, the development of their physical nature was enhanced by the constant exercise of vocal music." The Hutchinsons bore 16 sons and daughters many of whom joined the troupe as the group performed professionally. As with many families during those tough times, a number of the children did not survive childhood. When the elder Jesse died in the early 1840's, Jesse Jr. took control of the group. Their first public performance was in in Milford, New Hampshire, in 1840 and they toured extensively in the New England area till their first New York concert in 1843. About this time  an antislavery convention was held in Milford attended by Wm. Lloyd Garrison. . . . The custom at once enlisted the sympathies of the young men. Accustomed to roam at freedom among their own Hills, they abhorred slavery and pitied the slave. More than this they nobly resolved to exert their influence on behalf of the captives. To this end they prepared and sang antislavery songs. By comparison to the songs described above, The Seasons is rather benign. Stated to have its origins in a "popular air.' I've not been able to identify the source, perhaps a reader with a sharp ear can identify it for us. Indeed one of our (many) sharp eared and knowledgeable visitors, Vivian Williams recently wrote to us to inform us that the melody for this song is from a minstrel tune, Boatman's Dance by Dan Emmett published a mere three years earlier in 1843. That song appeared in a number of editions as either an "Ethiopian Sereneade" or "African Quadrille" in the 1843-45 time period. In 1950 the American composer Aaron Copeland included it in his first set of "Old American Songs." That version was first performed by Peter Pears (tenor) and Benjamin Britten (piano) on June 17, 1950 at Aldeburgh, in Suffolk, East Anglia, England. The cover information on the cover is somewhat typical of the times in that it is full of hyperbole and becomes an ad for the song itself. Though mostly filled with ornate text in a number of fonts, this sheet does have artwork that depicts the four seasons as a group of cherubs in differing poses that illustrate the season they represent. The smaller picture of the cover above shows little detail however the Scorch version shows the cover in larger detail so listening to and watching the music in the Scorch version will give you a better view. The cover states: "A Farmer's song arranged as a quartett as performed by the Hutchinson Family in New York City & State and throughout New England generally with universal acceptance." The bit of hedging on the "general acceptance" is interesting. It either acknowledges their controversial nature or is a rare admittance that not everyone appreciated their music. It is a unique admittance of reality in an otherwise inflated performing world. The song is simple and not particularly memorable, the lyrics come in a heaping helping of 9 verses and choruses which, as with the Irish Lament, may have taxed the listeners to the limit. Combined with a rather short and uncomplicated musical theme, the repetitiveness could be the reason for the "generally accepted" line! We've only provided three of the verses in our lyrics and Scorch windows. If someone is interested in all of them, just drop us a line. Much of the music from this period included choruses for voice, in some cases, we've tried to present the Scorch versions with the MIDI approximation of singing so that you can appreciate the vocal harmonies as written.